All cereal crops are members of the grass family. Cereal grains contain a substantial amount of starch, a carbohydrate that provides dietary energy. Rice grains by the IRRI. Members of the pea family. 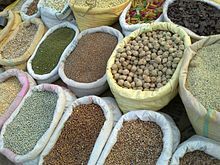 Pulses have higher protein than most other plant foods. They may also contain starch or oil. 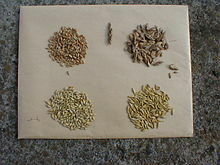 Grains grown primarily for the extraction of their edible oil. Vegetable oils provide dietary energy and some essential fatty acids. They can be used as fuel or lubricants. ↑ Vaughan, J. G., C. Geissler, B. Nicholson, E. Dowle, and E. Rice. 1997. The New Oxford Book of Food Plants. Oxford University Press. මේ පිටුව අන්තිමට සැකසුවේ 31 ජනවාරි 2019 දින දී, 09:28 වේලාවෙහිදීය.